So you want to be a firefighter, huh? If you’re alright with the idea of walking into the most pristine back county you’ve ever laid eyes on…then setting it on fire with a drip torch, you were born to be a wildland firefighter. It’s important to remember that the vast majority of forest firefighting jobs are “seasonal.” Which means you’re contracted for a 6-month fire season. However, when your fire season begins varies dramatically by region. If you’re looking to work in Northern California (Region 5), you most likely won’t be asked to report to your work station until the middle of May. But if you’re interested in fighting fire in Arizona or New Mexico (Region 3) you’ll be expected to start much earlier – most likely sometime in March. 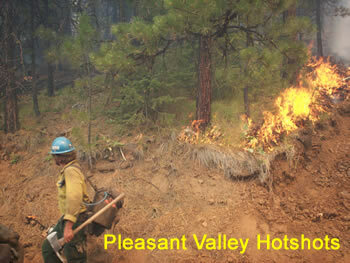 So if you aspire to be a sawyer with the Pleasant Valley Hotshots on the Tonto National Forest in Arizona – you have 6 weeks less to train than if you were you interested in applying for a position with the Feather River Hotshots on the Plumas National Forest in California. So plan your physical training accordingly – there’s zero excuse for showing up to work out of shape! We have put together some resources to help you land a job on a hotshot crew. General advice on how to get a job on a Type 1 Hotshot Crew. And if you’ve been a hotshot for a few seasons, and you’re thinking about moving on, you might want to check out our blog post on the differences between hotshotting and smokejumping. I have been looking for a website to see where i could apply and learn more about becoming a hotshot. I have put a lot of thought into this career and I really want to move forward with it in my life. This website gave me a ton of good information about being a hotshot. I am looking forward to putting in my application and I hope to be out on the front lines with other crew members.